I hope that you all are having a FANTASTIC Sunday afternoon and enjoying it before you know it, Monday will be here!!! lol. For today's card, I made it for a very close friend of mine. As you guys know, I'm a military wife and I've been through 1 and 1/2 deployments (your probably wonder how a 1/2 but my husband and I actually started talking more seriously toward the end of his 1st deployment). Deployments are one of the toughest things to go through, your always consumed with worry and than of course you miss your spouse. There are days when you are completely fine and there are days when you just wanna stay curled up in bed. ANYWAYS......My military wife crafting bestie Molly (Army Wife Learns the Cricut), has been having a hard deployment weekend, so Cristi (Scrappin 5 Little Cupcakes) and I thought we would dedicate our Sunday posts to her with cards we're sending her to hopefully make her smile!!! Be Sure to head over to Molly's blog and leave her a comment to cheer her up!!! Im sure she would LOVE IT! So, I had the perfect idea and used my Brand Spankin New Hello Kitty Greeting Cartridge!!! I was really debating on whether or not I would be getting this cartridge. I felt like it was kiddish but all the images are really cute!! One's like this, I think i will be using quite a bit! Even my hubby asked "Are you serious? Hello Kitty? How old are you? 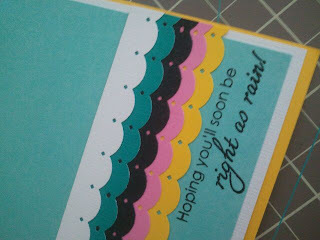 "...my response "Five" LOL And Of course I used the Scrappy Mom's "Sweet Somethings" Stamp set....Which I LOVE!!! And I saw the sneak peak for the Winter Stamp Set......I WILL BE FOR SURE ORDERING IT! :) Also, as if I don't like to layer enough as it is.......I borrowed the techniques from Momo(Made by Momo) and went a bit crazy on the layering of the boarder punches! So I hope that you guys enjoyed the card!!! 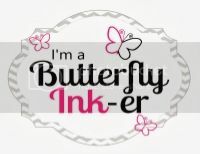 DON'T FORGET--Tomorrow is the start of the Creative Scrap's Challenge week....and it will start out with Cristi over at her blog! Now, just because we're designated certain days, doesn't mean that those are the only days we will necessarily be posting. We will be posting our own work(non challenge related) during the week...but are designated days will be dedicated to the Creative Scraps Challenge. You two are the best!! Thank you so much!! I love Hello Kitty! Tell Jesse I am five too!! I love the colors you chose :-) Thanks for bringing a smile to my face! 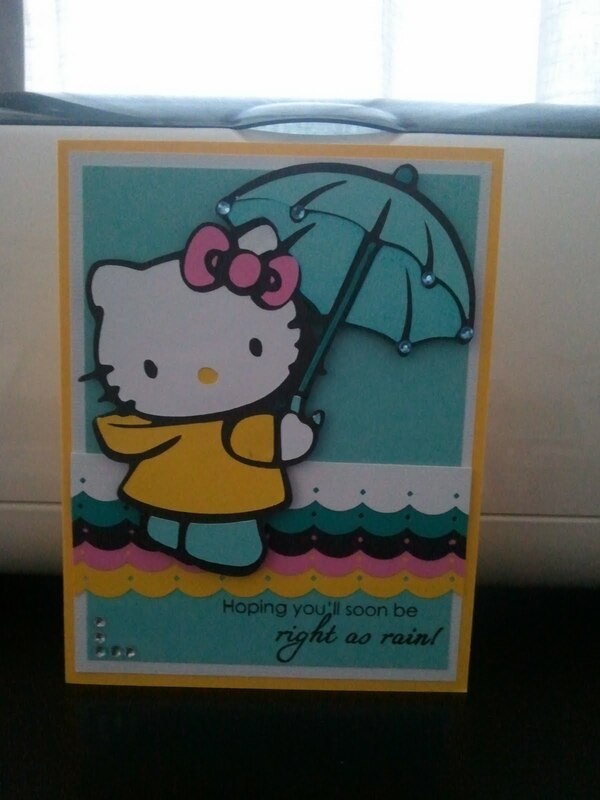 Super cute, sweet card! I stopped over at Molly's blog and left some words in hopes to cheer her up. Sounds like your challenge week is going to be fun. Hope you are enjoying the weekend:). Molly-your are so welcome! I cant wait to get ur pkg out! Steph- thank you for leaving a comment at her blog. I know it will cheer her right up! I hope u enjoy creative scraps challenge week! Very cute.. it will bring a smile to anyone.. thanks for sharing.. So adorable I love the bling on the umbrella. Super Cute!!!! Very cute card! I stopped by Molly's blog to leave her some love. :o) I know your card will help too! You know...I am not into Hello Kitty at all but this is so stinkin cute...who would have thought! I may have to give that cart a look! Welcome to Creative Scraps Sunday Challenge!!! My Day for Creative Scraps Challenge Week!! Cricut Card#2 for the week! Episode 22- Making Your Own Pattern Paper!